The Honor Tour - a group that takes WWII veterans to Washington DC to visit te WWII memorial - stopped at Cape Central High School on Friday, October 17 for its send-off ceremony. 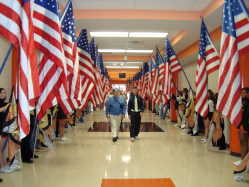 Jordan Sheets escorts one of the veterans down the flag-lined Tiger Alley into the Tiger Fieldhouse, where the ceremony was held. My son played the violin for this ceremony and I was unable to be there. I was wondering if any knows how I could get some photos of him playing for the veterans. I would appreciate this so much. My son played the violin during this ceremony. I was unable to be there. Does anyone know how I can get some pictures of him playing for the veterans? I would appreciate this so much. Thank you.